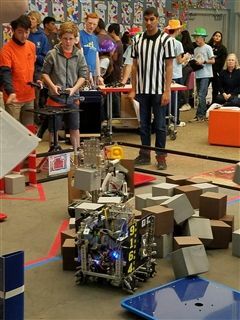 On January 13, Pacific Ridge’s upper school robotics teams put in a strong performance at the second FIRST Tech Challenge League meet at La Jolla Country Day School. 4262 Ridgebots placed first and 9266 Pyrobots placed sixth among 17 teams! Each year, teams engage in a new game where they design, build, test, and program autonomous and driver operated robots that must perform a series of tasks. This season, students participated in the Relic Recovery Challenge. Robots were required to pickup foam blocks and place them in a pattern, among other tasks. The league championships are March 4.